Not too long ago, in 2003, when I was first getting really skeptical of the official story on 9/11 and angry at Bush's clear intent to invade Iraq for no good reason, I came across a site that claimed the people who thought 9/11 was an inside job were "as crazy" as those who thought the Titanic disaster never happened. I would like to question whether the Titanic disaster did actually happen. The titanic had a twin ship that had been wrecked and roughly patched, but couldn't really sail anymore; Insurance companies would not pay for that wreck, so they disguised it as the Titanic, that was still allowed to cross the atlantic, and sent it on purpose against an iceberg, counting on the many other ships around that part of the ocean to save all the passengers. Then something went wrong, the ship was sinking too fast, people could not be evacuated in time etc etc. I have no source on this but I suppose it is all on the internet. Of course, like you say it could all have been fake, to spice up the newsreels of the old days. But you gotta put in it some sort of scam to make money out of it, then it makes more sense. Last edited by joey on Wed Feb 13, 2013 12:31 am, edited 1 time in total. And they are buried with a "picture opener" program that makes it slightly harder to copy the image address, so you'll have to click on them yourself on that site or guess the file name. Also, I noted that this one is called "completed titanic pictures 3", which is funny. As opposed to "not yet completed"? 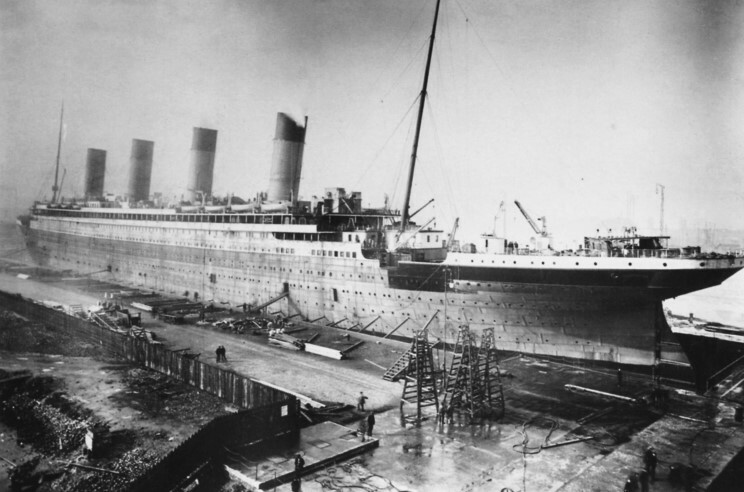 Here is the Titanic one year before launch. Where is this? 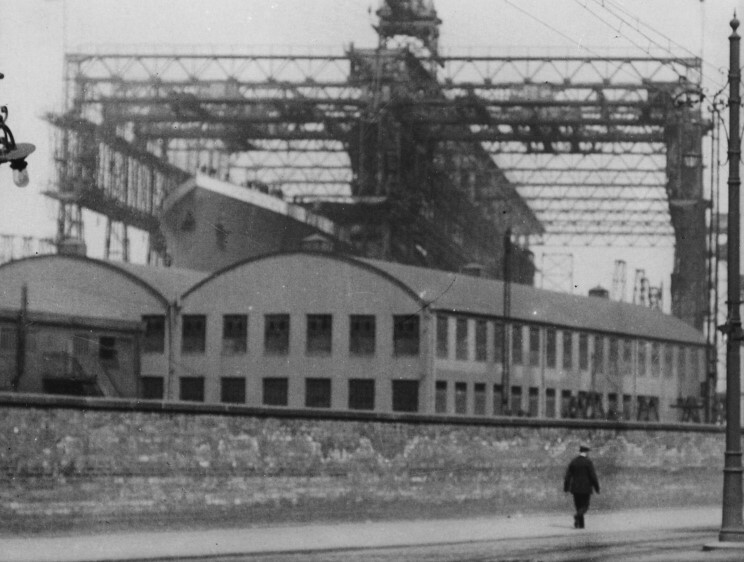 Here is the Titanic fitted with 3 functional funnels and 1 dummy funnel. I enjoy the constant blinding fog surrounding this ship's history. My idea behind the conspiracy theory of course is that it was invented by the hoaxers to create a mystique about something that never existed. By suggesting imaginative ideas like "Titanic's twin was a cover up" or "Titanic was actually steered by Martians" it ignores the question of Titanic's existence in the first place. That is my main question right now. 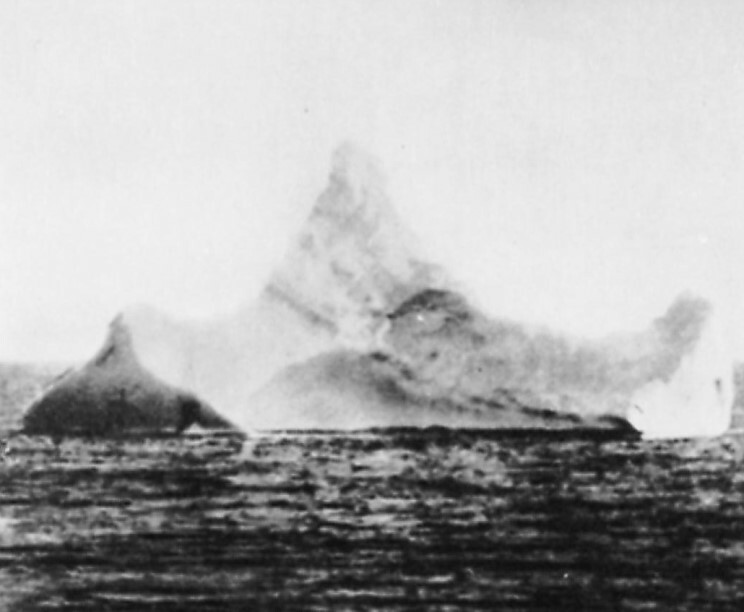 The iceberg which the titanic struck causing it to sink. Rumors of paint being seen on the iceberg were circulated but never confirmed. It's just that this video was released or credited in 2004, making it a potential Hollywood trickery thing. This was only a few years before the alleged sinking of the Lusitania. 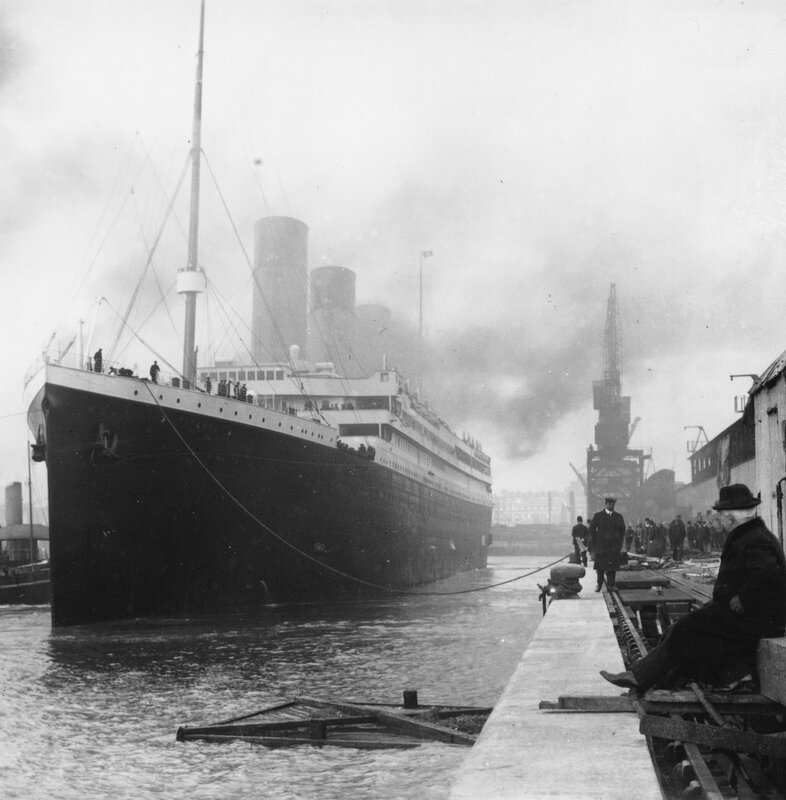 Could the Titanic have originally been a false-flag type hoax, but somewhere during the operation, things went wrong, they had to drop the "attacked" angle for whatever reason, and fall back the iceberg story instead to explain the ship's disappearance. It certainly seems like the time period they would be gearing up for The Great War's propaganda machine. Titanic may have been practice for the Lusitania. The constant, incessant, rather absurd emphasis on why we must all remember the poor victims of the Titanic (actually, no explanation ever really given - except that it "touches us all" - wishful thinking of the propagandists?) points to this being the case. Good postulation! Actually, if they knew they would make the Lusitania into a sob story in advance, the Titanic disaster story would be excellent "priming" of the public to be sensitive to victims of boat wrecks and to train them to be mournful of them in a specific way. Yes, bringing the country together as one to mourn a collective loss at sea. A great primer / test-run of the use of media to harness society's sympathy and emotions in the lead-up to WW1. It would be interesting to go over the specific newspaper articles surrounding the Titanic events. Might have also been one of the earlier cases of using Vicsims, actors, fake-survivors/witnesses, etc. ? The ships were three: Olympic Titanic, Gigantic. The insurance Theory is as good as the Federal Reserve theory. My theory is more technical: the use of coal. As Hinderburg was the last airship, Titanic was the T-Rex of coal ships, from then they used OIL! Last edited by reel.deal on Mon Oct 01, 2012 11:19 am, edited 1 time in total. Elton John's comment after seeing Titanic was "Get that fat cow off the screen." corsarino wrote: The ships were three: Olympic Titanic, Gigantic. This is a very interesting idea. There had been a revolution in the technology of the engine, and a conversion had to be enforced on the whole world. Maybe certain train wrecks too were caused or faked for the same purpose. 15 years after the sinking of the Titanic, in Kafka's America the trip across the Atlantic is in fact a lament on the horrors of the coal furnace in the belly of the gigantic ship. I really have to re-read that book. I have always been a great admirer of Kafka, but now I gotta wonder if he (or rather Max Brod who was responsible for having the books published) had in fact an hidden agenda, be it for his socialism or his alleged crypto-zionism. The power of literature in those years was very significant, and it is undeniable that Kafka's books participated like few others to the definition of the self-hate and the malaise of the so called western world. Still today it is enough to mention the world "Kafka" to immediately evoke a sense of oppression and failure on "our" entire society. Not a secondary accomplishment! p.s. according to wicky (http://en.wikipedia.org/wiki/Olympic_class_ocean_liner) the three ships were: Titanic, Britannic and Olympic. Titanic and Britannic sank. The Britannic hit a german mine during WWI! What the odds! Quite a convenient metaphor there, too - a ship named after Britain sunk by an evil German mine. Hmmm. Quite, that's what I'm implying. Also if you see how the early Titanic disaster stories were caught up immediately with the New York press/newspaper cartel you start to smell something fishy again. In addition, the boat that found some lifeboats from the Titanic was named the New York. And also, a newspaper advert that listed things like the date, the ship etc., and was thought to be a code by the Germans for an attack on the ship. Laying out the perp in today's parlance, I suppose. But, I thought you all might be interested in a forum that was written on Fortean Times discussing the topic in 2004. I hope you get a kick out of it, as well as a few branches for new lines of research. hoi.polloi wrote: In addition, the boat that found some lifeboats from the Titanic was named the New York. Maybe it's about the starting of a new age, the age of "America" versus the age of "Britain". Olympic is the only ship of the three that survived. The Olympians, Zeus & co., were thirteen if one counts also Hades, who ruled the underworld. More interestingly perhaps, the greeks identified a god named Titan, or Hyperion, with the Sun. He rode the skies in his chariot carrying light. Across the centuries Titan merged with Apollo. These things mean little to me, although they are very fascinating. But maybe they mean a great deal to them, Lucifer being the "light-bearer" and all that.